The magnificent 20mm metallic green Carpenter Bees, Xylocopa (Lestis), dig nest burrows inside dry flower spikes of Xanthorrhoea grass trees or in soft dead trunks of Banksia. Once widespread in southeastern Australia, these bees are now extinct on mainland South Australia and in Victoria. These dazzling bees probably became extinct in these areas because fires and landclearing destroyed their nest sites. There is concern that remaining Carpenter Bee populations on Kangaroo Island, SA, continue to decline. University of Adelaide researchers have recommended specialised fire management procedures on Kangaroo Island to protect the remaining Carpenter Bees there. Dr Remko Leijs and co-workers at the South Australian Museum are also setting up hundreds of artificial nests for the Carpenter Bees each year on Kangaroo Island in fire-affected areas. They are seeking funding to help them continue this important work. 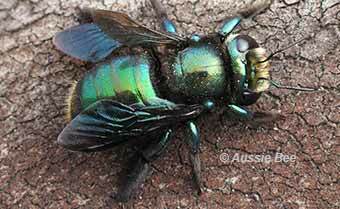 Fortunately Xylocopa (Lestis) Carpenter Bees can still be found in New South Wales and Queensland. We hope that the sad losses of these Carpenter Bees from SA and VIC will encourage better conservation and protection of these iconic bees in NSW and QLD. Biology, distribution and conservation of Green carpenter bee (Xylocopa aeratus: Apidae) on Kangaroo Island, South Australia. R Glatz, R Leijs and K Hogendoorn, 2015.